When dental emergencies and pain occur, our attention is often focused on diseases and injuries related to the teeth. However, it's important to remember that the soft tissues of the mouth — the gums, tongue, lips and cheek lining — may also be affected. While they are tough enough to stand up to the oral environment, these tissues can be damaged by accidental bites, falls, sports injuries, and scalding liquids. They may also suffer injury from foreign bodies that become lodged below the gum line, and they can develop painful and potentially serious abscesses. Soft tissue injuries in the mouth don't usually bleed excessively — although blood mixing with saliva may make any bleeding appear worse than it actually is. To assist someone with this type of injury, you should first try to rinse the mouth with a dilute salt water solution. If a wound is visible, it can be cleaned with mild soap and water; if that isn't possible, try to remove any foreign material by hand, and rinse again. Bleeding can usually be controlled by pressing damp gauze (or, if unavailable, another clean material) directly to the site of the injury, and keeping it there for 10-15 minutes. If the bleeding doesn't stop, immediate medical attention will be needed. Try to see a dentist within 6 hours of the injury for evaluation and treatment. This usually involves determining the extent of the damage, performing initial restorative procedures, and occasionally suturing (stitching) the wound. An antibiotic and/or tetanus shot may also be given. Occasionally, foreign objects may become lodged in the space between teeth and gums, causing irritation and the potential for infection. There are a few foods (such as popcorn husks) that seem especially prone to doing this, but other items placed in the mouth — like wood splinters from toothpicks or bits of fingernail, for example — can cause this problem as well. If you feel something stuck under the gum, you can try using dental floss to remove it: Gently work the floss up and down below the gum line to try and dislodge the object. Light pressure from a toothpick may also help work it free — but avoid pressing too hard or pushing the object in deeper. If that doesn't work, see a dentist as soon as possible. Special tools may be needed to find and remove the object, and you may be given medication to prevent infection. 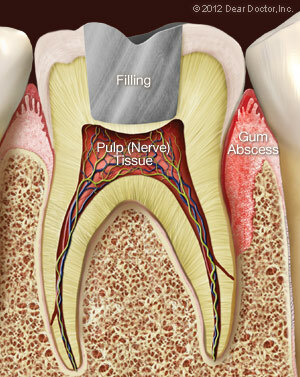 Sometimes called a gum boil, a periodontal abscess is a pus-filled sac that may form between teeth and gums. It is caused by an infection, which may have come from food or other objects trapped beneath the gum line, or from uncontrolled periodontal disease. Because pressure builds up quickly inside them, abscesses are generally quite painful. Symptoms may include a throbbing toothache which comes on suddenly, tenderness and swelling of the gums or face, and sometimes fever. Occasionally, pus draining into the mouth through an opening in the sac relieves the pressure and pain, but may cause a strange taste. If left untreated, abscesses can persist for months and cause serious health problems, including infections that spread to other parts of the body. That's why it is important to see a dentist right away if you experience symptoms. He or she will find the location of the abscess and treat it appropriately. Treatment usually involves draining the pus and fluid, thoroughly cleaning the affected area, and controlling the infection.